As we all know, nuts, seeds and legumes are very healthy and we have been advised for many to add them into our diet. I remember the days as a Nutrition student, munching away on many kinds of nuts and seeds during lectures. However, my digestion got worse and worse. How could something supposedly so good for you could make me feel so heavy, tired and unwell? Although packed with healthy fats, protein and minerals, in order to get that all good-stuff assimilated into your body, it is highly recommended you prepare them by soaking and/or dehydrating them in order to “activate” them. Simply because nuts, legumes and seeds contain what we call “anti-nutrients” such as phytic acids and enzyme inhibitors to prevent them from sprouting until they get some sun and rain in order for them to grow. Therefore, if you don’t soak them, they will be hard on your stomach and induce some painful symptoms like cramping and gas. By soaking them, enzyme inhibitors are neutralized, the beneficial enzymes are activated and the nutrition content increased. Soaking makes seeds, nuts and legumes easier to digest and the nutrients more easily absorbed. The reason is simple; like animals, plants have anti-nutrients to protect themselves. How long should you soak for? A good rule is to soak any nuts, seeds, legumes (lentils, beans and chickpeas) for at least 12 hours (overnight) and more if you wish. Then, depending on the recipes you wish you make, you can use the seeds and nuts as they are great for pates, smoothies, milk, raw burgers. If you wish to use nuts/seeds for other recipes such as crackers, raw bread, then it is important to dehydrate them using a dehydrator for at least 1 or 2 days. Alternatively, you may use your oven on the lowest temperature and with the door open. Interestingly, some health food shops have started to have pre-soaked/sprouted legumes, grains, nuts and seeds, available – always ask your health food shop as they may have it or will be able to order it for you. Once you start eating dehydrated nuts/seeds, you will never want to go back as the taste is completely different. They are crunchier and lighter. Nuts are full of protein, fibre and essential fats and a serving of 30g will give you a health boost which mixes together some valuable vitamins and minerals. However, all nuts have different amounts of nutrition and will offer you different health benefits. Below we discuss the health benefits of 4 different kinds of nuts in order for you to find your match. Nuts are all relatively equal when it comes to the amount of calories there are per gram and, in moderation, they are all healthy. The mix of omega-3 fatty acids, protein and fibre will help you to feel full and suppress your appetite. If you are following a strict diet then almonds contain the lowest-calorie count at 160 per ounce. 23 nuts; 6 grams protein, 14 grams fat. Peanuts – although they are technically known as legumes – are high in folate which is a mineral necessary for brain development and that may protect against cognitive decline. For this reason they are especially good for vegetarians who can suffer from a shortness of folate and for pregnant women in the protection of their unborn baby from birth defects. Peanuts also have a high content of Vitamin E.
All nuts contain heart-friendly omega-3 but walnuts have high amounts of alpha linoleic acid (ALA). Studies have shown that ALA mayWhile all nuts contain heart-healthy omega-3 fats, walnuts (14 halves contain 185 calories, 18 grams fat, 4 grams protein) have high amounts of. Research has suggested that ALA may help your heart rhythm, they have suggested that walnuts are as effective as olive oil to aide with reducing inflammation and oxidation in the arteries after eating a fatty meal. It is recommended that eating around eight walnuts a day will help to achieve the benefits. Pistachios are especially rich in vitamin B6. This is important in keeping hormones balanced and healthy. These nuts are a good option for women who have problems with their period. They are also, the only nut to contain reasonable levels of lutein and zeaxanthin, two antioxidants that play an important role in protecting the eyes. Pistachios also contain potassium and fibre – in fact a 30g serving has more than three times that supplied by the equivalent weight of plums. 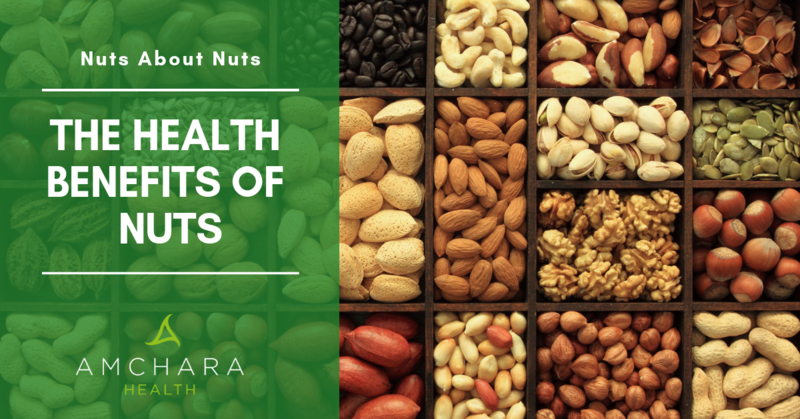 There are so many different varieties of nuts, all with different tones and flavours making them ideal for adding to your cooking and all with varied health benefits so in this article we will break the information down so that you can clearly see what's great about each kind of nut. In general, nuts are jam packed full of fibre, protein, fibre and omega-3 fatty acids which makes nuts one of the most powerful super-foods of the autumn season. 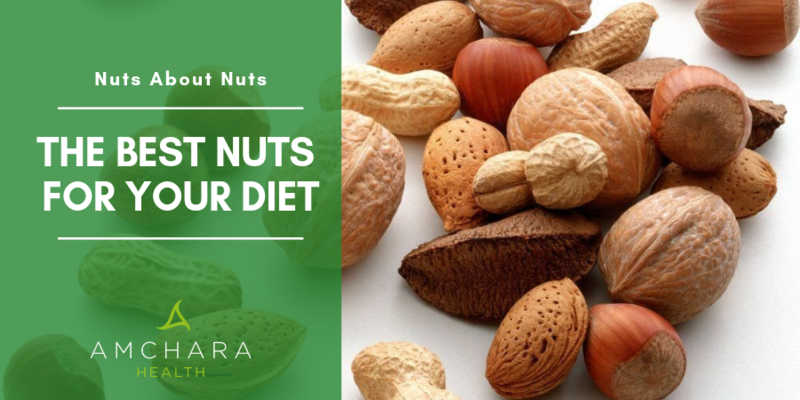 A single portion measuring around 30 grams of uncoated, natural nuts is probably one of the healthiest snacks that you could go for and gives you a beautifully rich concoction of vitamins and minerals. So, here's our guide to nutritious nuts! You will probably know that at Amchara, we try to encourage you to avoid dairy where you can. Instead of replacing cow's milk with soy milk however, we usually recommend almond milk instead as soy milk is usually a GMO product. Almonds are a fantastic choice if you avoid dairy as they are very high in calcium, however they are also a healthy snack choice if you do eat dairy. Almonds also contain high levels of vitamin E, which is essential for healthy, younger looking skin. To get the most out of them though, eat them whole with the skin left on as it is packed with flavanoids, strong antioxidants that are also great for heart health. Brazil nuts contain high levels of selenium, which is a natural mineral that the body needs to be able to produce the active thyroid hormone and so eating Brazil nuts is highly recommend for sufferers of an under-active thyroid. Selenium is also essential for a healthy immune system and helps the body to heal wounds more quickly. Just 3 Brazil nuts daily gives you all of the selenium that your body needs. Cashew nuts contain a large number of minerals including iron, zinc and magnesium. According to our naturopath, Rhaya Jordan, if there was only one mineral that she could tell you to get most, it would be magnesium because there are so many health benefits associated with magnesium. You can add cashew nuts to salads or your favourite stir-fry. Chestnuts contain the least calories and saturated fats than any of the nuts, making them a great snack if you're losing weight. Eaten raw, these are also a fantastic source of vitamin C, and contain high levels of fibre and carbohydrates. They also contain a good amount of the B vitamins, especially B6 although chestnuts are lower in protein than other nuts. If you eat a gluten-free diet, ground chestnut flour can be used in gluten-free baking or eat them raw or roasted as a healthy snack choice. Choose hazelnuts as your healthy snack if you have an worries about high levels of homocysteine, which is an amino acid that has been linked to heart problems and other illnesses including Parkinson's Disease. Hazelnuts contain plenty of folate too, which is important for keeping homocysteine within normal levels. Pecan nuts are a food to consume for a healthy heart. They are also crammed full of plant sterols, which are effective at keeping cholesterol levels low. Pecans also contain lots of antioxidants, helping to decrease the amount of plaque formation that causes hardening of the arteries. Pecans also contain lots of vitamin B3, which is great if you're feeling tired a lot fatigue as vitamin B3 helps the body to access the energy in the foods we eat. Pistachio nuts are crammed full of vitamin B6, which is a vitamin essential for hormone regulation. They also contain good amounts of two antioxidants that are important to healthy eyes and vision, as well as high levels of potassium and fibre. There is an ancient belief that foods have been shaped by the creator to indicate their use in the body and walnuts are a fine example of this. Crack one open and you see what looks like two sides of the brain! Amazingly not only do walnuts look like a brain but they also contain substances that help to keep your brain healthy. Many lifestyle factors particularly high risk behaviours such as poor diet, lack of exercise, exposure to environmental toxins, excessive alcohol consumption and smoking can be detrimental to brain health. These common every day habits can lead to enhanced oxidative stress and inflammation, all of which help to accelerate the progression of ageing in the brain. Evidence suggests that oxidative damage and inflammation is at the root of many chronic conditions such as depression and Alzheimer’s. Walnuts are a great food choice for nourishing the brain. Their cognitive health benefits are thought to be due to the high levels of polyphenols and antioxidants they contain that help to reduce oxidative stress and inflammation. Scientists believe that over time these degenerative processes affect brain function. Walnuts are also a rich source of Omega 3 essential fatty acids (EFAs) which along with their polyphenolic compounds help to protect nerve fibres, promote neurogenesis (new nerve growth) and improve signalling in the brain. They also contain a wide range of vitamins including B1, B2, B3, B5, B6, folic acid and vitamin E as well as important minerals magnesium, iron, zinc and potassium. Many studies have identified that B vitamins play a key role in producing brain chemicals that affect mood and other brain functions. The mineral Zinc may also play a part in keeping you happy as research has shown that deficiencies can result in symptoms of depression. In addition to their valuable omega 3 content, walnuts are brimming with omega 6’s too – another healthy fat with a reputation for promoting brain function. Walnuts are a good veggie alternative for those who don’t want to get their omega 3s from oily fish and because they are so nutrient dense they make a really healthy snack option. 100 grams of walnuts contains 15.2 grams of protein, 65.2 grams of fat, and 6.7 grams of dietary fibre. They are relatively high in calories though, so two or three at a time is more than enough to curb a hunger pang without piling on the pounds. Walnut butter is a great healthy alternative to ordinary butter and can be found in most health food shops. It’s also pretty easy to make – all you need is a bag of walnuts and a food processor. Just whizz up the walnuts until you’ve got a nice sticky, buttery paste, pop it into a clean glass jar – seal and refrigerate and there you have it. All natural, gluten free, sugar free, vegan, low carb – heaven!